Until the 1980s, a “cadaveric donor” was essentially synonymous of a kidney donor. 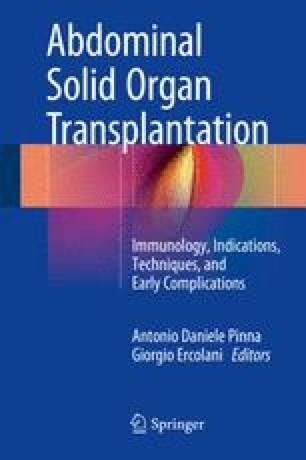 When better immunosuppression brought transplantation of the liver, heart, and other extrarenal organs to a practical level, the ostensibly ethical concern of many kidney transplant surgeons was whether removal of multiple organs would result in damage to the renal allografts. Such anxieties were allayed by the development of procurement procedures that were flexible enough to allow the excision of all the organs above and below the diaphragm without jeopardizing any of the individual grafts. Techniques for multiple abdominal organ procurement were first described by Starzl and have been adopted throughout the world. However, it was initially thought that removal of the whole pancreas for transplantation would be incompatible with procurement of the liver, because both procedures originally called for retention of the celiac axis and portal vein with the respective allografts. It was subsequently demonstrated that the simultaneous retrieval of the intestine, pancreas, and liver from the same donor was shown to be routinely feasible, using modifications of the standard methods. To do this safely, it is necessary to have detailed knowledge of the vascular anatomy of all three organs.